Ben has been starting to really pretend. Here and there, I'm like "is he pretending?" Today it was so clear and intended! We got home from the vet (Abby is stitches free!!!) and Ben just wanted to play in his room. 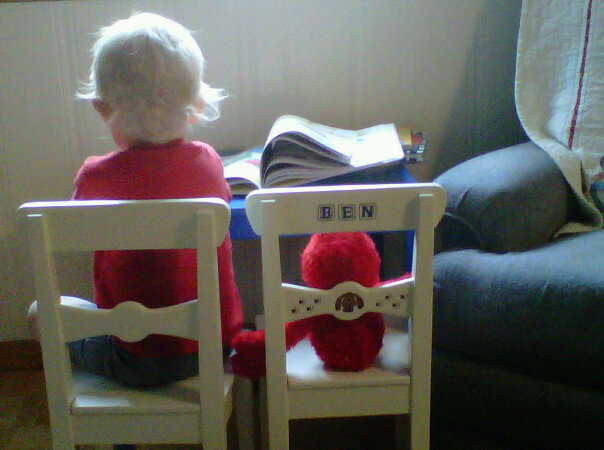 He was dead set on putting his Elmo in the other chair, then wanted to read to him! He would run to his shelf pick out a book, always putting the old one away, come back, climb next to him and read. I ran for all the cameras. The video camera battery=dead. The other still camera batteries=dead. So I quickly plugged them in and snapped a shot with my phone thinking this will never go on long enough to get these batteries charged. Oh was I wrong!!! He just had a ball with it! Book after book. Then, he realized SpongeBob was on the shelf and added him to his reading club. He just sat there, turned the pages, laughed, leaned over to them and made sure they were sitting up. Very attentive to his audience. From time to time, he wanted me to read to them and would put his arm around Elmo and just watch me read. Truly a precious moment I just wanted to share. Now he's throwing macaroni and cheese on the wall. Precious moment over with. I better go.